BANGKOK — Thailand's ruling military junta has filed a complaint accusing the leader of a popular new political party of sedition and aiding criminals, a move he described as politically motivated. The party, Future Forward, ran a strong third in elections last month that were also contested by a pro-military party. Future Forward's leader, Thanathorn Juangroongruangkit, said he would report to police on Saturday to answer the summons against him. He could face up to nine years in prison. The summons did not specify what actions prompted the complaint. It said Thanathorn was accused of sedition for using words or writing "to raise unrest and disaffection amongst the people in a manner likely to cause disturbance in the country." 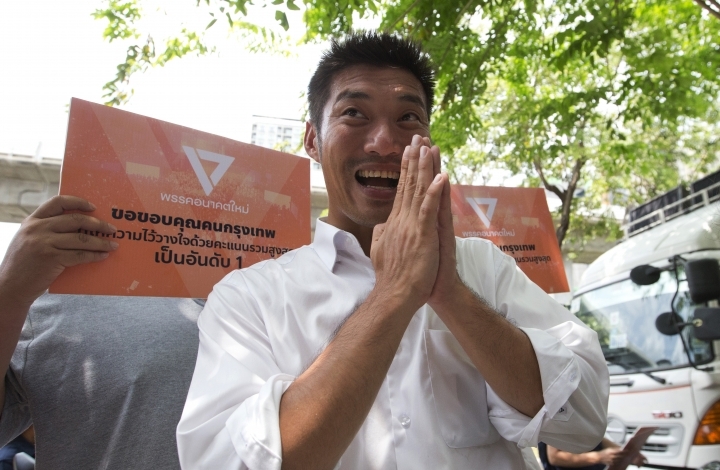 Several criminal complaints and protests to the Election Commission have already been lodged against Thanathorn and his party. 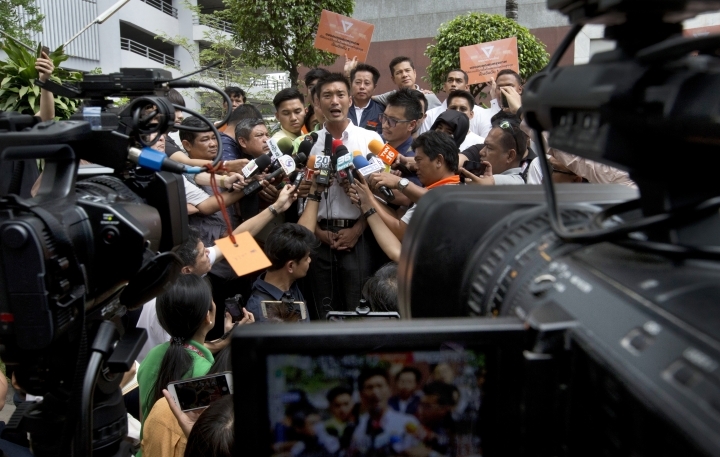 Speaking to reporters on Wednesday before a tour of a Bangkok neighborhood to thank voters, Thanathorn said the new legal action was expected and "nothing new." "We are prepared mentally. There's nothing to worry about," he said. "We believe in our innocence. We believe these cases are politically motivated." Thanathorn commented further about the summons on his Facebook page, saying it was clear "that old political games don't end after elections but in turn become even more intense because they are afraid of Future Forward, afraid of our victory that surpassed many people's expectations." He said he would answer the summons to show his innocence and "prove that Thailand's justice system will not submit to becoming a tool for dictators." 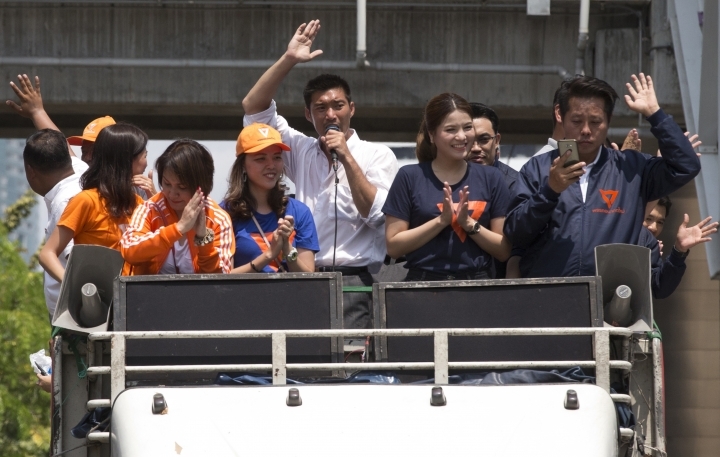 Preliminary results of the March 24 general election failed to give any single party a majority, making it unclear whether pro- or anti-junta parties will hold a majority in the House of Representatives. The Future Forward Party is a junior partner in an anti-junta coalition that claims have a majority of seats, but the final official results won't be released until May 9. Between now and then, there could be shifts in party alliances, and there is concern that the state Election Commission, widely regarded as sympathetic to the junta, could disqualify the elected candidates of its opponents. The army has several times publicly shown its disdain for Future Forward's policies. The country's influential army chief on Tuesday issued a thinly veiled attack on the party, not mentioning it by name but implying that it has foreign-influenced ideas unsuitable for the "Thai-style democratic system," which is a constitutional monarchy. Gen. Apirat Kongsompong, the ruling junta's secretary-general, said the army would do its duty, "which is to protect, maintain and defend the institutions of nation, religion, and monarchy." Respect for the monarchy is a sensitive and emotional issue in Thailand, and accusations of disrespect are sometimes used by opportunists to smear their political opponents. Thailand has a lese majeste law that makes criticism of the monarchy punishable by up to 15 years' imprisonment per offense. Thanathorn has said his party's primary agenda is to stop Thailand's military from intervening in politics, and also suggested its budget be slashed. The new party's critics also have tried to tried to sow suspicion that it is allied with former Prime Minister Thaksin Shinawatra, who was ousted by the military in a 2006 coup and is treated as the arch-enemy of Thailand's royalist establishment. The party denies any such ties, and a large part of its appeal appears to be that it supports neither the military nor Thaksin. The co-founder of Future Forward, law scholar Piyabutr Saengkanokkul, has come under pressure as well, including a summons to be a witness in what appears to be Thanathorn's case. Piyabutr has been in hot water with conservative Thais who see him as a threat to the monarchy after social media began circulating a video of a Feb. 17, 2013, lecture in which he described the role of the monarchy in democratic governments. He responded that the posting was misleading and was not about Thailand's system. An obscure conservative organization filed a complaint about him with the Election Commission, and on Wednesday singer and actress Haruthai Muangboonsri formally submitted a legal complaint to police accusing him of being a threat to national security. The military has governed Thailand since then-army commander Prayuth Chan-ocha staged a coup in 2014 against an elected government. Since then, Prayuth has served as junta leader and prime minister, and is the candidate of the pro-military Palang Pracharath Party, which according to preliminary results grabbed the biggest share of the popular vote in last month's election. According to a new constitution implemented under the junta, prime ministers are chosen by a joint vote of the elected House of Representatives and the appointed Senate, giving Prayuth a great advantage. However, his opponents could still control a majority in the lower house, making it difficult for him to pass laws or get a budget approved, and making any government he would head unstable because of the possibility it would face a vote of no confidence. Associated Press writer Grant Peck contributed to this report.